Wojciech Haliniak and Witold Rosa are the founders of the Company. The cooperation was established already during the studies at the Silesian University of Technology in Gliwice, thanks to the work for the Student Cooperation. In 1990 the agreement of a civil partnership was concluded, which currently operates as a Joint Stock Company. The first experiences were gained during the implementation of cleaning services for PKP (Polish Railway) taking care of wagons, depots, and offices. 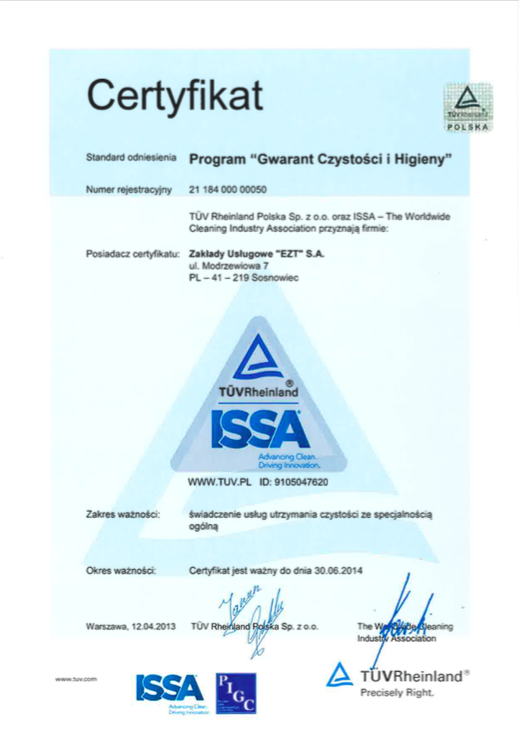 The recipients of our services include Przedsiębiorstwa Komunikacji Miejskiej (Public Transport Company) in Sosnowiec, Katowice, Dabrowa Górnicza and Heat and Power Plant in Bedzin, PEPSI in Katowice. 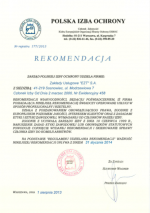 In 1995 we received a status of Sheltered Workshop, and in 1996 a license for running a business in the field of person and property security, which we started in 1997, when the Silesian University entrusted us security of their students, staff and property. 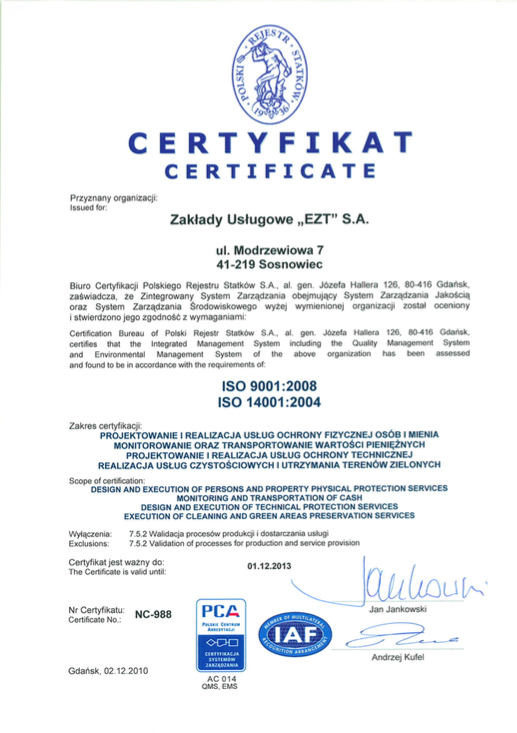 Also, we protected the property of other customers, such as STRABAG in Krakow, WODOCIĄGI in Gliwice, Mittal / Huta Cedler / in Katowice. 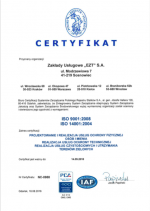 Parallel until 2000 we ran production and sale of abrasive and sprinkles shingles in the Plant of Zdzieszowice and sewing of workwear and protection clothes in the Plant of Bukowno in the years 1996-1999. Both, the main service industries of cleaning and protection have been developed by expanding geographical scope and the range of services (including cleaning of parking lots, production halls, offices, supermarkets, bus depots, construction sites), as well as training personnel, introducing professional equipment and new methods of rendering services, and thus affecting the customer satisfaction. In 1998 we set up a private limited company with private shares of the same partners and over six years we operated as the two companies. 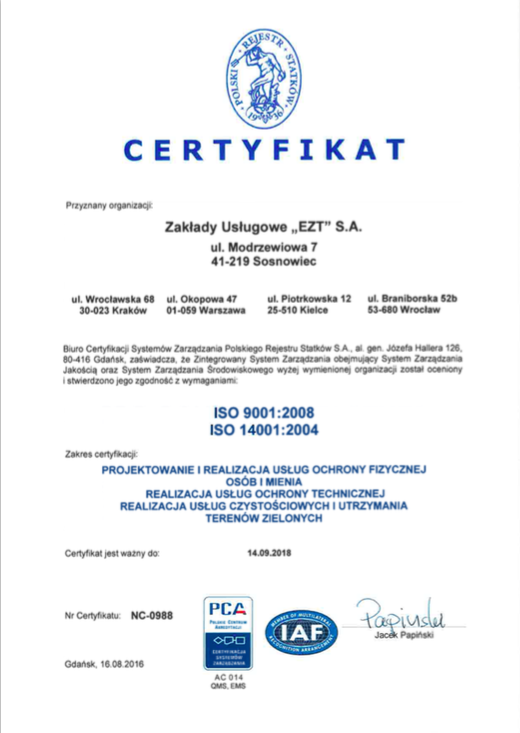 In July 2003 the companies merged and a new business called Zakłady Usługowe “EZT” Spółka z o.o. started. 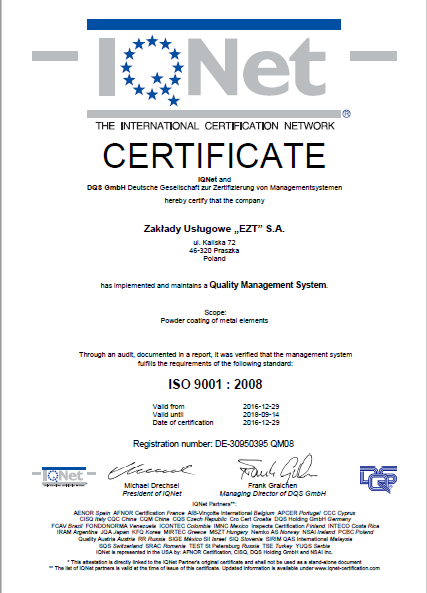 In May 2009 we transformed into a joint stock company – Zakłady Usługowe „EZT” S.A. In 2011 our company was awarded a prestigious title of “Gazelle of Business 2011” in the twelfth ranking of the most dynamically developing small and medium-sized enterprises organized annually by the “Puls Biznesu”. We entered a circle of proven and reliable companies, whose driving force is reliability and formation of a stable growth in turnover in the next three years. This award motivates and obliges our company to maintain a development trend. On 7 January 2014 Zakłady Usługowe „EZT” S.A. launched a line of powder coating in the manufacturing premises of “Neapco Europe Sp. o.o. “in Praszka. 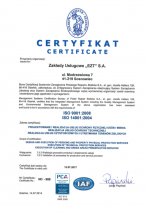 New investment Zakłady Usługowe „EZT” S.A. assumes painting components (elements of drive-shafts) for cars of renowned brands such as Volkswagen, Mercedes, Smart, Opel, BMW and Ford. Appointed team for taking care of the line has control over the proper course of painting elements according to specific quality standards given by the final recipients of the parts. The project was realized in cooperation with the main engineers of the “Neapco” production plant who supervised the course of the implementation of the lines and participated in the first audits. Within the investment , a new production hall was renovated (with full equipment necessary for the proper process of painting) and hired a team of regular employees responsible for the painting process. The quality requirements of manufacturers of leading automotive brands are constantly increasing. For this reason, in the middle of this year we plan to launch a new paint shop with a much greater efficiency and excellent quality parameters. 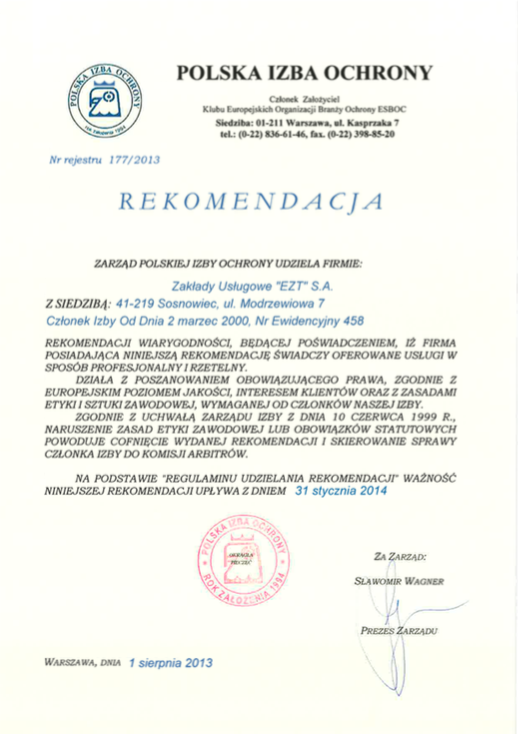 Recommendation of the Polish Chamber of Persons and Property Security. 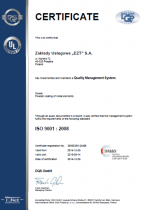 DQS ISO / TS 16949: 2009 Certificate in terms of painting metal elements, valid until September 2018. 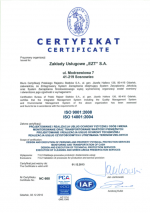 Certificate from DQS ISO / TS 16949: 2009 in terms of painting metal elements, valid until September 2018. 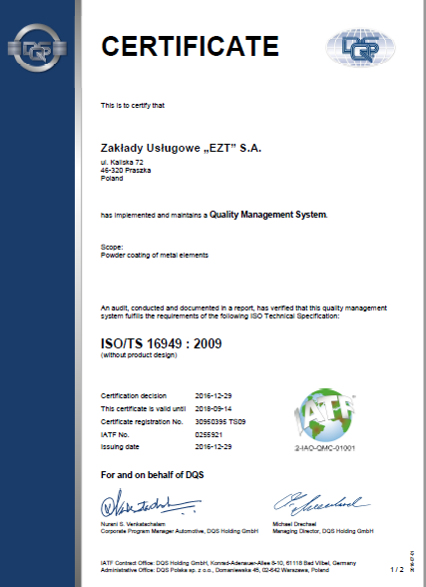 PRS Certificate in the field of ISO 9001: 2008 and ISO 1400: 2004, valid until September 2018. 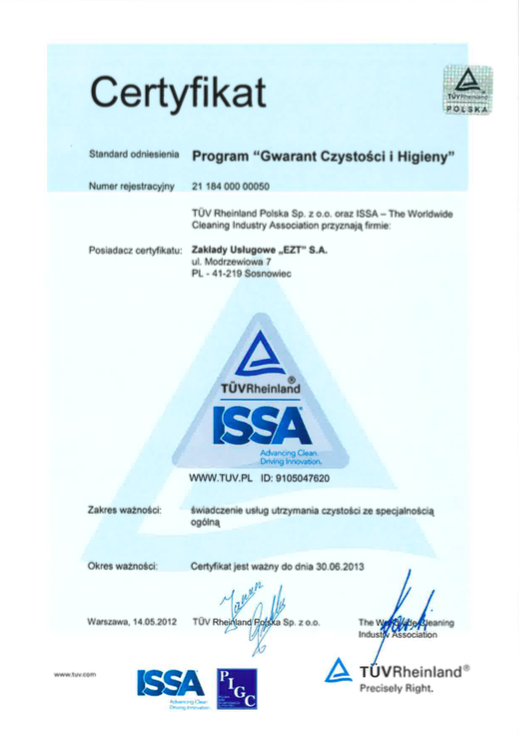 "TRÓJKĄT CZYSTOŚCI" Certificate - an industry certification program for quality of service companies in the industry to maintain cleanliness. Guarantor of the cleanliness and hygiene. 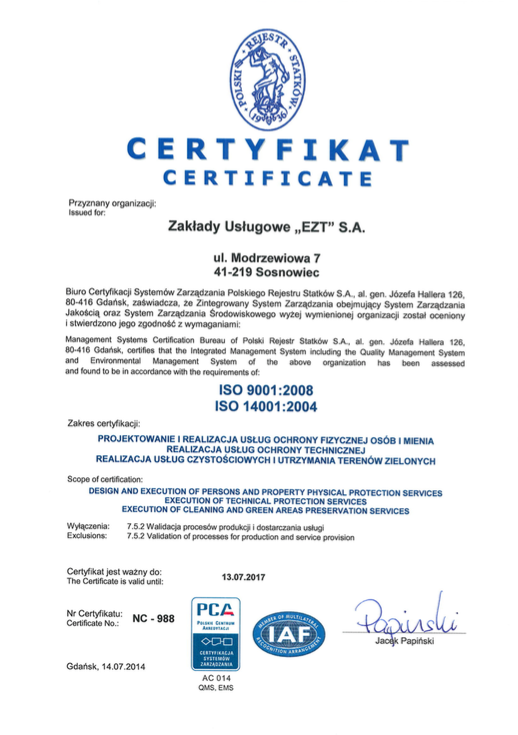 Certificates : 2016 PSC, Polish Cleaning Industry Employers' Association, PSC. Starting powder coating line in Praszka. Certificate No. 22/2013 - security staff’ training in first aid. the prestigious title of "Business Gazelle 2011" in the ranking for most rapidly developing small and medium business. Joining the organization PKPP Lewiatan. 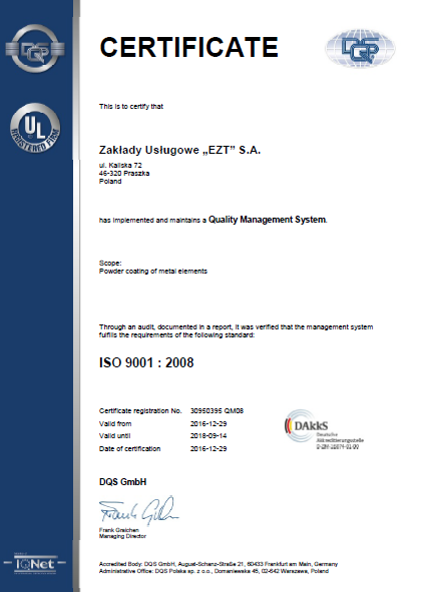 Transformation into a joint stock company Zakłady Usługowe "EZT" S.A. 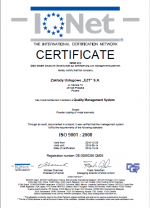 Implementation of environmental management system ISO 14001. Launching new product, which is a DNA program- a breakthrough system of identification and security of vehicles and property. 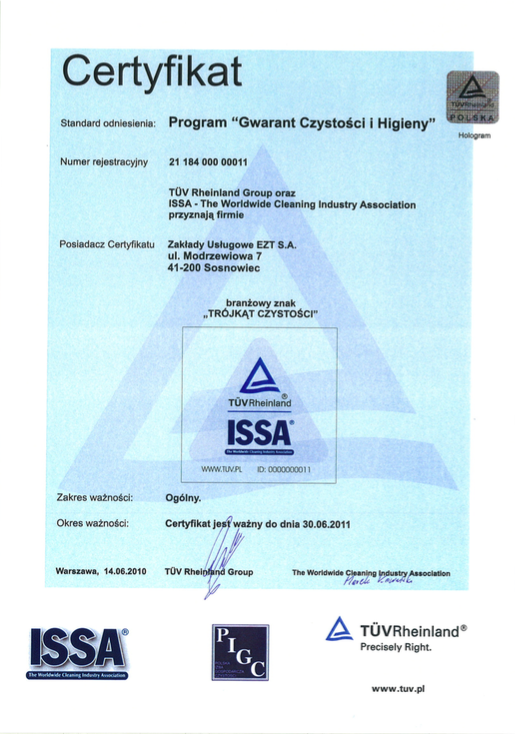 Participation in the "Guarantor of the cleanliness and hygiene" - receiving "TRÓJKĄT CZYSTOŚCI" industry certificate. Obtaining a Certificate in the field of cleaning services by Polish Association for Cleanliness and a Certificate certifying that the company is a licensed user of the KRD BIG SA system and runs a business ethically by the Economic Information Bureau SA National Debt Register. Obtaining a license for technical protection and broadening the scope of services with technical protection - installation and maintenance of alarm devices. 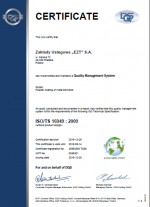 Implementation of ISO 9001: 2000 management system. 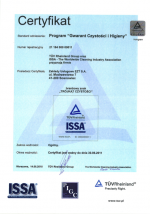 "Fair Play Company" Certificate for its business activities - professionally rendered services, proper organization of work, fairness in relation to Customers and Suppliers. The merger and start as Zakłady Usługowe „EZT” Spółka z o.o. Joining the Polish Chamber of Persons and Property Security (PIOOiM), which recommends companies operating in compliance with the law, clients' interests and the rules of ethics and professional art. Currently, Polish Chamber of Persons and Property Security. Starting a business in Public Limited Company with private shares of the same partners (over the six years the company operates as two companies). Receiving Concessions of the Minister of Internal Affairs and Administration to run a business in the field of peoples and property security realized in a form of direct physical security. Obtaining the status of Sheltered Workshop; thus, customers have the possibility of reducing the mandatory payments to the State Fund for Rehabilitation of Disabled Persons (PFRON). 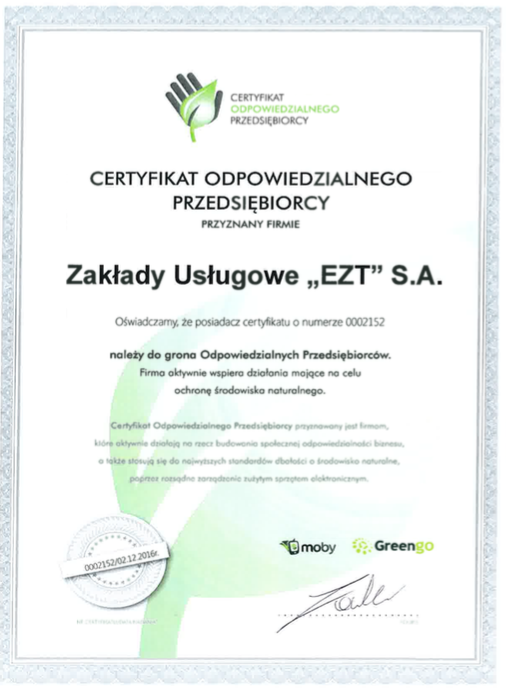 Founding a civil partnership Zakłady Usługowe „EZT,” offering cleaning services. minimizing the negative environmental impacts related to the activities of the Organization and implemented processes. Quality Management and Environmental System Policy is constantly reviewed and evaluated in terms of implementation and in the framework of the annual reviews carried out by the management. I assure you that this quality and environment policy is well-known, understandable and observed by all employees of the Organization.